Published Tuesday, April 13, 2010, OK personal/derivative use; link www.lovethatimage.com. I promised you scenic, and this is about as scenic as it gets, as far as I am concerned. 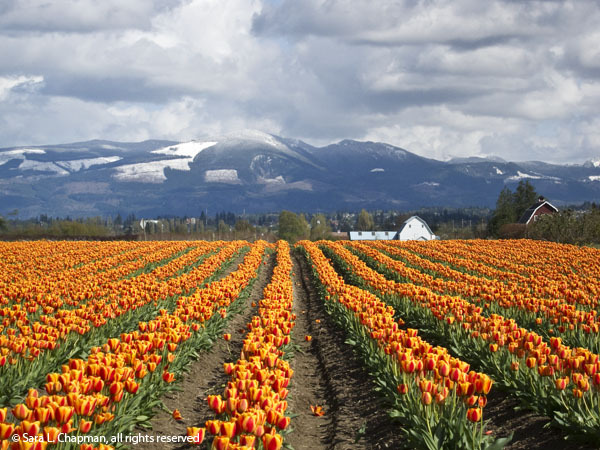 The Skagit Valley Tulip Festival is a photo opportunity from heaven. Seeing all the people snapping pictures shows photography is alive and well in America today. I know it’s a stretch, but I’m counting the snowy fields in the distance as an entry for Watery Wednesday. Certainly visit Outdoor Wednesday, and Color Carnival, too. And remember, you can always click on Sara’s Fave Photos above to return to the full blog with my latest post on top. I love this photo, and I’m calling it my Best Post of the Week. Beautiful tulips – and I think the snow counts as water. 😉 Dropping by from Outdoor Wednesday. Holy Toledo! That is a beautiful picture, and a whole heck of a lot of tulips! It’s been a tough winter but spring is finally breaking through. Nice shot. Thanks for your visits and your kind comments. I love this image and I’m glad you do, too. I agree: snow counts as water and what a perfect background the snowy mountains provide! The vivid color of the orange tulips really contrast beautifully with the dark sky and forests. I wonder which field this is at….I went to three different areas, but I don’t recognize this one. How fun! Will you go back next year!? Oh, it’s so pretty. I haven’t been in years. I love tulips and it would be so cool to see fields of them. Your photo is gorgeous! Lovely — great contrasts and colors. Very nice job. I think living near all those lovely tulips must be a lot like Heaven! Oh so beautiful; I can’t believe we lived in the Pacific Northwest for a million years and never went to the Tulip Festival. So many tulips of the same variety in one spot. Is this also a commercial venture by chance? I’m thinking maybe this is a tulip farm that supplies people like me with beautiful tulips that we otherwise would not have the opportunity to enjoy. If so, give them a big thank you from me and all the other tulip lovers who live in the desert! awww…. it’s too beautiful! I can imagine the huge field of tulips. What a gorgeous photo, absolutely stunning. The tulips are such a vivid color against the backdrop of those amazing mountains and clouds. I love the swirling affect of the clouds and the straight lines of the tulips…incredible light…so beautiful! lived in WA 11yrs now and haven’t yet been – looks so beautiful – maybe next yr! Hubby bought me a beautiful pot of yellow tulips for Easter but, WOW, your photo is absolutely breathtaking! Nice shot!!! What a gorgeous shot! Love all the tulips! Such a contrast with the snow covered mountains in the background. Very, very, scenic. I can see why photographers flock there. This is just absolutely amazing Sara! Oh, wow! I don’t know what’s more beautiful – the flowers or that amazing background!